During my stay in Switzerland, I grew a fondness towards lakes. How can I not? This country has many of theme. Also, because I happened to have one of the lakes as my front yard. No exaggeration there. It took me only a few steps to get to the lake, and the view is breathtaking every single time I look. I actually come from the country of Indonesia, and we do have lots of lakes back home but there is just something magical about this one. 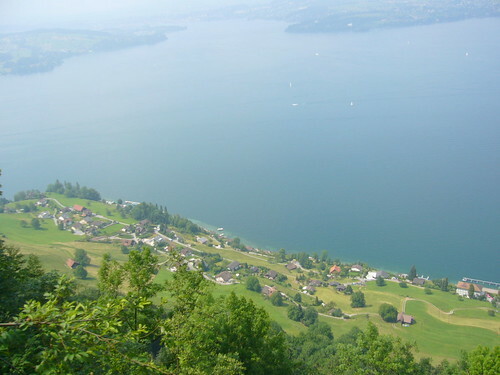 To be exact, this is Lake Lucerne or commonly known as Vierwaldstättersee. The name is easily translated to the lake of the 4 forested cantons. Bordering Lucerne, Uri, Schwyz, and also the formerly known Unterwalden. All of the picturesque photos that you might come across online is probably taken up from Mt. Rigi and Mt. Pilatus. But not for me, I prefer this one from Bürgenstock. During my stay, I have the honor in commuting myself from the village of Vitznau to Lucerne by a ferry or steamboat (yep you read it right. There is still a steamboat available for your transport) every friday to sunday. And it never bores me one bit. In the summer, people including myself would take a dip by the edge of the lake. Also there are some spots with sand and all to do barbecue. Yet in the winter is a whole other story. Most of the surrounding mountains are covered with snow and everything seems to come out from your old fairytale book.